Mellor Coachcraft caused something of a stir when it announced that it was developing an all-electric version of the market leading lowfloor, accessible minibus, the Orion. The Woodall Nicholson company followed that up earlier this year at the CV Show when it unveiled the prototype of the exciting new vehicle. So we set out to meet up with Mellor’s Managing Director John Randerson, to talk about electric vehicles, and get up close to the new contender. The development of electric vehicles in the 5t to 7.5t sector has been very slow. 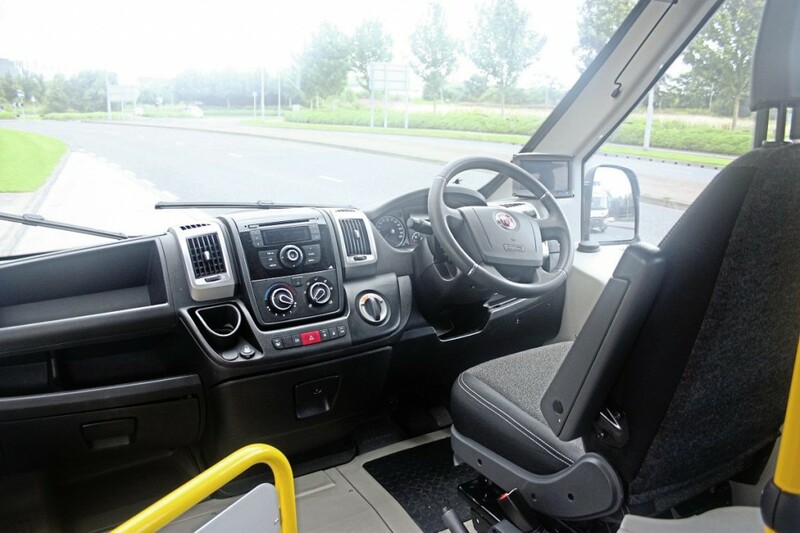 While development of larger buses and even small vans has forged ahead there has been a marked reluctance by the big van manufacturers to extend that to the large van sector. Out of the main van producers, only Iveco offers an electric version of a vehicle in this category and there are some difficulties in converting that into a viable minibus. We are promised an all-electric version of Volkwagen’s new Crafter but that is unlikely to appear before the end of 2018 at the earliest. John Randerson was keen to add an electric option to its range of minibuses and, facing the lack of a mass-produced viable base vehicle, decided to take a different route: “I knew that we had an ideal base for a viable electric minibus in our Orion if I could find a suitable driveline package,” said John. John and his team have been working on this project for some time and carried out extensive research into possible solutions to the problem. This centred on Europe where developments in electric drive components is more advanced. Eventually they settled on Dutch company EMOSS who had a suitable, proven driveline package. The end result is the Orion E, a 16-seat minibus which has a range of around 100 miles and the ability to re-charge in an hour and a half. Range is often cited as a drawback to electric vehicles but John contends that it doesn’t have to be. 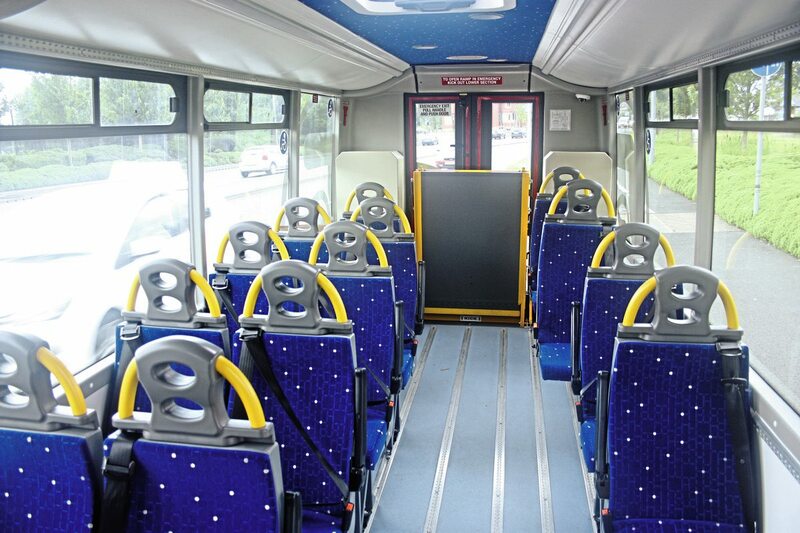 As part of its research, Mellor studied usage of minibuses and found that the majority cover relatively small distances and often have considerable lay-over periods in their schedule. With the ability to do a full battery re-charge in 90 minutes the range can easily be extended. 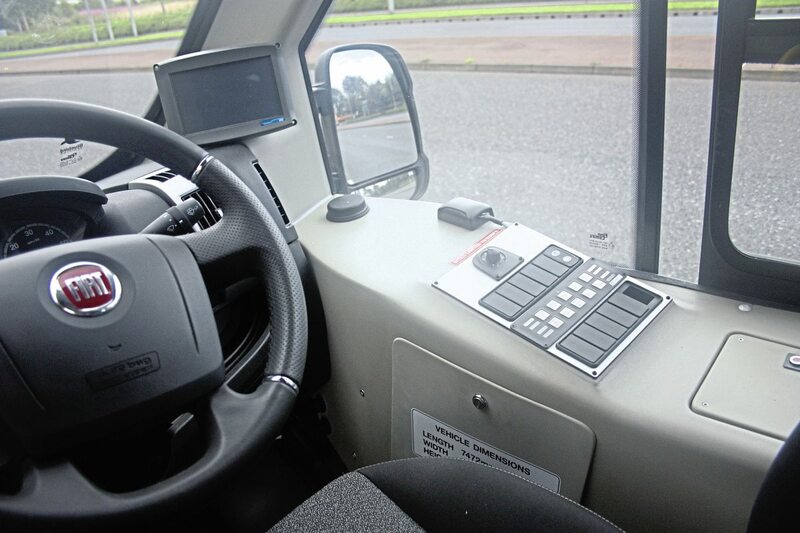 You wouldn’t use an Orion E to do a long journey; it just isn’t designed for that, but it could easily cover a normal day of mixed duties within the operator’s local area. Orion E is not designed to be used continuously. It is designed to operate over reasonably short distances and for short periods of time. Typically in town and city centres or on dedicated services such as health and education. John has concerns about bodies in the UK that are supposed to be promoting the use of green vehicles. He has found a marked reluctance by these bodies to consider funding small buses. Scotland for example already has legislation requiring its cities to eliminate the use of vehicles using fossil fuels. However, they will currently happily fund a car, a small van or even a large bus but at the moment will not consider funding a bus unless it has at least 22 seats. That situation has to change because there are plenty of situations, especially in city centres, where a smaller bus would be viable. Funding small green buses would also enable the parc of non-polluting vehicles to grow more quickly and at less cost. John contrasts the British attitude with what he has found in Europe. Here he has found that grant-giving bodies are almost falling over themselves to offer operators funding and without any of the British restrictions on size. It is for this reason that John believes that initially the main demand for the Orion E will come from Europe. Mellor have already set up distributorships for the product in a number of European countries and more are in the pipeline. The Orion E will receive its European debut at the upcoming Kortrijk Show and John is confident that orders will quickly follow. Let us hope that the British situation on funding small green buses is resolved quickly. The basis of the Orion E is the standard Orion which uses a monocoque body structure designed and built entirely by Mellor. The vehicle has a totally flat floor and uses Mellor’s own design of trailing link rear suspension. This combination means that the vehicle has a ride height of just 300mm. 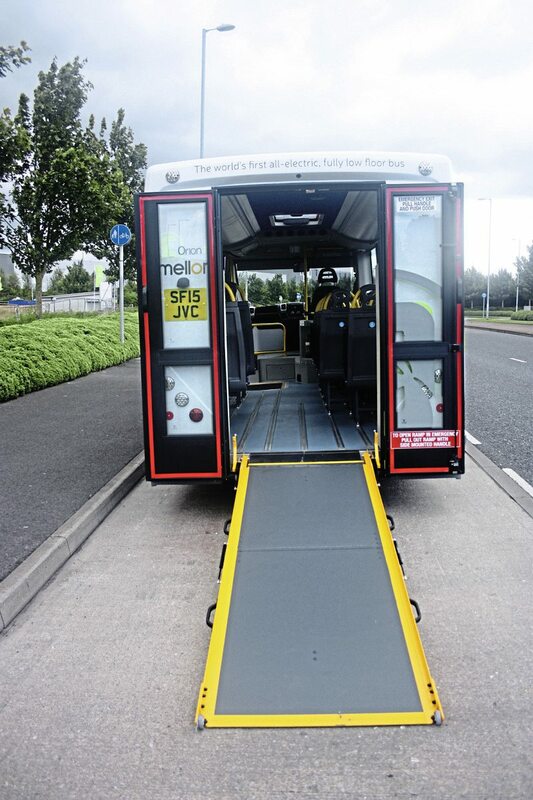 This gives the ability to offer direct wheelchair access through the wide side entrance or via rear doors and a short ramp, or both. As with the standard Orion, the Orion E is offered with rear doors or with a solid rear end. The vehicle is 7.479m long, 2.2m wide and 2.645 high. The wheelbase is 4.89m. In service bus form without the rear doors the vehicle can carry 16 passengers. If a wheelchair passenger is carried the wheelchair bay is in the conventional position behind the driver with the wheelchair facing rearwards. Seating for other passengers drops to 15. With the rear-door configuration, up to three wheelchairs can be carried with four other seats retained. 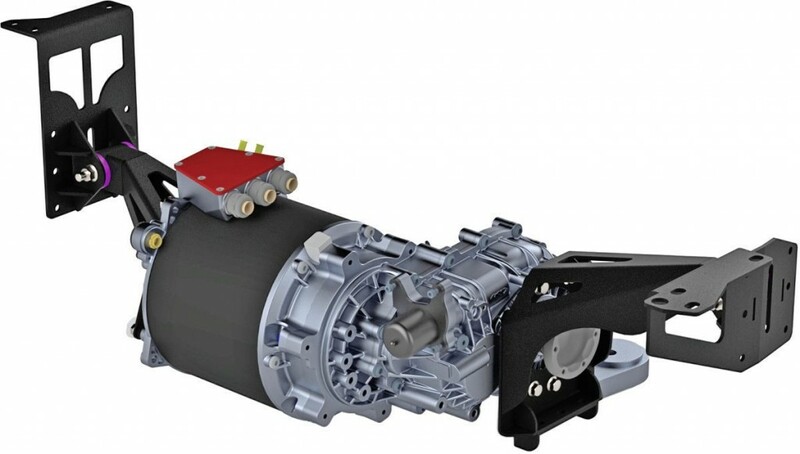 Power is provided by a 158kW electric motor and reduction gear. While 158kW is the maximum power output of the drive package in normal usage, power demand is around 90kW. Where electric power scores heavily is in torque output. The Orion E has a maximum torque output of 2500Nm but in normal usage only 1500Nm is required. The system voltage is 400 volts DC provided by lithium ion 72kWH @ 180Ah batteries. In the prototype the batteries are mounted in two banks housed at the back of the saloon but in production vehicles, these will be mounted on the roof of the vehicle. This will require some modification of the vehicle’s roof structure but this will be in the form of additional structure and will not involve modifications to the existing structure. The drive package gives the vehicle a maximum speed of 56mph (90kmph) and a range of 100 miles. The system can be fully re-charged in 3½ hours although there is also a fast-charge option which allows re-charge in 1½ hours. 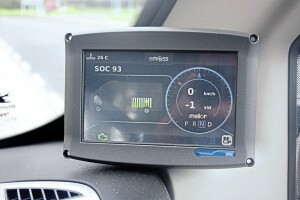 The system incorporates an element of automatic re-charge when the vehicle is not under load. In other respects the Orion E is the same as the Orion, with the same independent front suspension and power steering although that is now electric-powered. Rear suspension is air. The body is exactly the same, using the same windscreen and saloon glazing, electrically-operated, fast-action side entrance door, twin fully-opening rear doors and fold-out ramp. 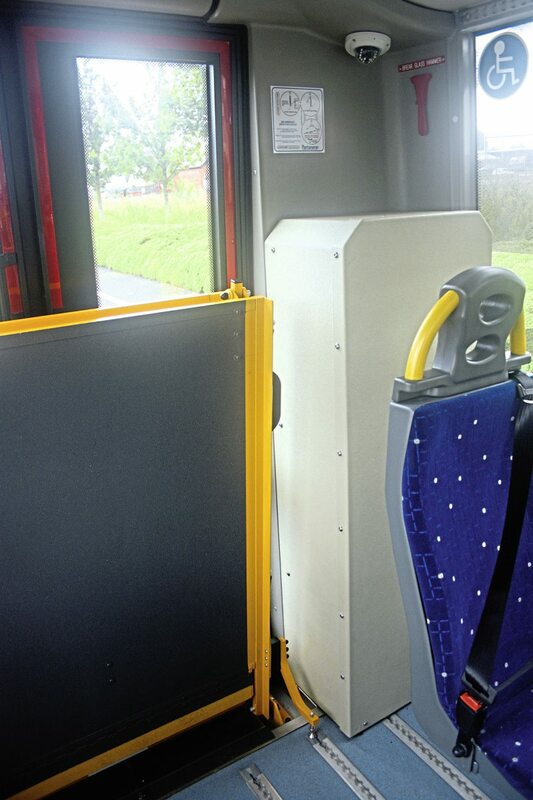 All the internal trim and fittings are exactly the same and operators retain the options on seating types fixed or track mounted. Where there does have to be some compromise is in the use of additional electrically powered ancillaries such as heating and saloon air conditioning, which if used extensively would result in significant power usage. For this reason the Orion E currently uses the existing convection heating system and air conditioning, other than the cab, is not offered. Mellor are investigating replacing the existing heating system with one powered by bio-diesel. Driving the Orion E is a new experience and it does require a somewhat different style of driving. To engage drive there is a simple turn switch on the dash which has three positions N-neutral, D-drive and R-reverse. There is of course no engine noise so you have to use the dash mounted screen to see if the vehicle is operating. This also shows you the road speed, the amount of charge remaining and also shows when the system is re-charging automatically. Being electric, power is instant, acceleration is rapid and the vehicle is quickly up to optimum speed. It does all of that in total silence. When you’ve spent a lifetime driving vehicles with internal combustion engines it does seem very strange but you soon adjust to the new, silent world. The only sound from the drive unit is a faint hum when you are on the move. You have to adopt a different style of driving. The aim is to try to use the available power as efficiently as possible. That means the use of a light touch on the accelerator pedal. I would liken it to driving as if there was an egg under your right foot. There is no need to use heavy accelerator inputs; a light touch is all you need and that is important because heavy use of the accelerator will only result in using up the available power reserve much quicker than necessary and thus shortening the range. The art to getting the best out of the Orion E is to adopt a softly, softly approach. The system has in-built retardation features. Simply lifting your foot of the accelerator results in instant retardation and the amount of re-charge achieved in this situation is good. You can see the level of re-charge that is achieved by looking at the screen. Once you have got used to this new style of driving the Orion E is a joy to drive. Its performance is sparkling. It rapidly climbs to optimal speed and does it smoothly and of course quietly. Because of the automatic retardation you use the foundation brakes infrequently but they are there if you need them. 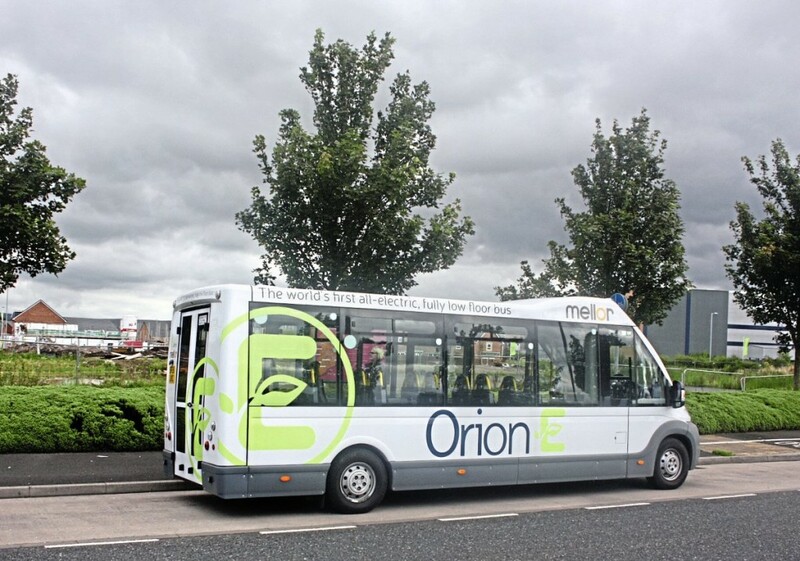 I drove the Orion E for about an hour around Rochdale’s crowded and busy streets and it was a real pleasure. During that time the vehicle used very little of the available power reserve primarily because the stop/start nature of driving in that situation meant I was getting plenty of re-charge power. I did run the vehicle at full speed for a short while and that obviously does deplete the available power reserve but not as quickly as I anticipated. In my opinion if you drive the vehicle sensibly you will not have any problems achieving the 100 miles on a single charge. This is a vehicle that you have to drive to really appreciate the benefits it could bring to your business. You will be impressed. At the moment the Orion E is quite expensive which is why green bus funding is so important but on the other hand you have no fuel costs, no road tax and much lower maintenance costs. Obviously as production climbs initial cost will come down. Batteries are warranted for five years but in his research John found that the batteries are in fact lasting much longer than that. There is a lot of development taking place into improving electric traction components and extending battery life. The University of Newcastle for example, which is very active in the research, already has a prototype motor which is half the size and half the weight of that used in the Orion E and it uses less power to achieve similar performance. The industry can look forward to the not too distant future when vehicles like the Orion E are a common sight in our towns and cities and we should applaud Mellor’s commitment in spearheading these important developments.